Have you donated money to a charity in the past month? Have you helped a stranger or someone you didn’t know who needed help in the past month? Have you volunteered your time to an organization in the past month? The numbers are tabulated and 3 percentages (one for each question) are generated for every country to have a fair comparison. I want to stress that this does not look at the magnitude of the actions (say amount donated) or the recipient, but it highlights action taken. The percentages are then averaged to generate a World Giving Score*. I also included data on GDP per capita (PPP) and Human Development Index, which I chose as a proxy for happiness (unfortunately most happiness indices, were either incomplete or dated). My plan is to split this post into 2 parts. In this part, I’ll make some observations on any interesting features of the data. In the next part, I’ll create a tutorial to walk through the creation process of the interactive chart. The highest Giving Index ranking nations are Australia, Ireland, and Canada. USA is number 5 and UK is number 8. The highest ranking country that surprises me is Indonesia at number 7. One possible theory is the fact that Indonesia has the world’s largest Muslim population and one of the pillars of Islam is charitable giving. However, based on that, we may expect to see Muslim nations top the Donating Money ranking but this is not the case. GDP has a moderate relationship (32% correlation) with World Giving Index, but stronger with Donating Money (54%). Not really a surprise. But there are some countries that really stick out in both charts. Singapore is one country with a high GDP which scored relatively low. Some of the lowest ranked for Giving Score included Greece (guess we can cut them some slack) and China. When seeing China’s low score, I wondered if separating countries by type of economy/government would have any noticeable effect. Similarly, I was curious if post-Soviet countries would also score low on the Giving Index. While there is some link, it isn’t that noteworthy. And, it would be hard to say if the underlying cause is the failure of a Communist regime or just that the countries aren’t as developed as they could be potential confounders. My favorite sequence is the following. Choose GDP on the Y axis. Start with Donating Money on the X axis, we already know there is some relation (54% correlation) and we can see that. Next choose Volunteering Time on the X axis. There is a correlation of only 9% now. Finally, with Helping a Stranger on the X axis, there is basically 0% correlation. So, individuals of certain countries may not have the money or time, but still lend a helping hand when available. In fact, the visible divide by region seems to disappear when comparing Helping a Stranger Percent. Many of the countries that stick out with high World Giving Scores compared to GDP are those that scored high in Helping a Stranger. The winner in that category? Liberia. Iran is another country that scores at rank 6. The US is ranked 3, while UK comes at 33. The lowest ranking country here is India. Countries that ranked highly on volunteering time include Turkmenistan, followed by Liberia, Uzbekistan, and Tajikistan. Who’d have guessed? I would highly recommend this report for anyone interested in the above as it goes much more in depth using the same data above. In fact, the World Giving Score comes from this report (hence the * above). And, they provide suggestions on how to change perceptions to improve giving and benefit all of humankind. 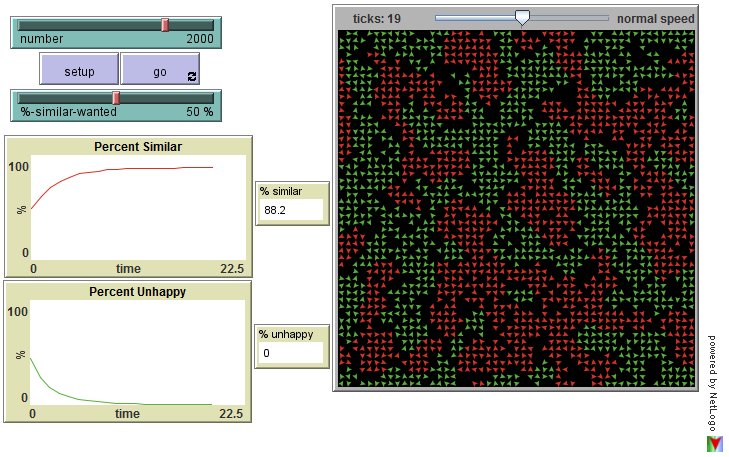 Setting up the simulation with random individuals (can look at this as green is wealthy/red is poor). Each individual wants 50% similarity and with random placement 41.3% are unhappy. Letting the model run (individuals move if unhappy), we see when unhappiness goes to 0%, we are at 88.2% similarity and segregation is visually obvious. Most of the “wealthy” here don’t even see how the “other half” live. Another interesting tidbit is that the poor tend to give to religious organizations and social services, while the rich tend to give to museums, universities, and art galleries. Perhaps part of the charity also fulfills the goal of leaving a legacy such as when a name is memorialized. The second graph in the link above is a pie chart of contributions in the US in 2011 by recipient type using data from the National Park Service. I was surprised at how religion is by far the largest category. So my question is what do religious organizations do with all that money? I assume some of it goes toward the needy, but would it not be better to give to those causes directly? Or does the religious organization function as a filter of sorts, by picking those causes they believe to be the most “worthy” of aid? The next largest chunk is education. It would be good to see a breakdown of how much of that is to universities and colleges, who already have insanely large endowment funds, as opposed to say inner city schools. The remaining organizations also receive significantly less than the faith-based ones. Always interesting to see the flow of money. Stay tuned for part 2 of this post, which will explain how to create the charts above.